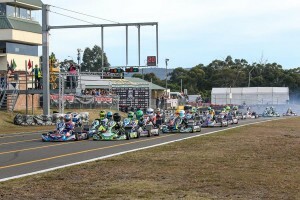 The race to declare the Australian representatives for the Rok International Cup will heat up this weekend at the penultimate round of the SP Tools Australian Kart Championship presented by Castrol EDGE to be held in Emerald, Queensland. Every single Vortex powered category has its Championship up for grabs, with KA2 producing an intense battle throughout the season so far for the Junior Vortex DVS drivers. Through consistency, Corsa Kart driver, Kai Allen holds a slender 10 points over Queensland JC Kart driver Jai Brown. Right there with him is Jaiden Pope who has been around the podium all season and won the most recent round in Newcastle. Despite missing the first round, James Wharton is fourth on points and continues to build in the Vortex form of racing. In KA1, which uses the Vortex DVS-SV, Queenslander Scott Sorensen leads by a meagre 14 points. He has got his run towards a second consecutive Championship back on track over recent rounds aboard his HDR Arrow, however round one winner – Lachie Dalton is by no means out of contention in his AWC Motorsport Academy kart. Dalton has been solid throughout the season and performed strongly at Emerald as a junior last year. Also performing strongly at the venue last year was PFG Race Team driver, Broc Feeney. Feeney just missed the podium in the corresponding Junior class last year and is looking for a big result this weekend. He enters fourth on the points ladder behind Joshua Denton, both still in contention for the title. Denton – who has concentrated on the AKC this year has performed strongly however finished down the order in Newcastle and will look to bounce back in his first visit to the Central Queensland track. The biggest Vortex category by entry – Cadet 12 – sees 40 karts entered this weekend. The driver they are chasing is Marcos Flack. The Queensland Energy Corse driver leads by four points over last round winner, Jimmy Pisczyk. The South Australian EVO Kart driver will take huge confidence from his first ever round win and the first for the EVO Kart brand at Newcastle. Harry Arnett is 30 points off second place in the Championship and after winning in Emerald last year is by no means out of contention. In Cadet 9, Kart Republic driver, Lewis Francis holds a comfortable lead. He leads the Championship by 34 points over Peter Bouzinelos with Max Walton a further 21 points back. Francis cannot afford any complacency with two rounds to go as it won’t take much for the likes of Bouzinelos or Walton to close in. Action gets underway on Friday with practice before qualifying and heat races Saturday with the final round of heats and finals on Sunday. To follow Vortex Engines go to www.facebook.com/vortexengines.